Perhaps the most important model in my book, The Language of Excellence, is the one for TWO CERTAINTIES. 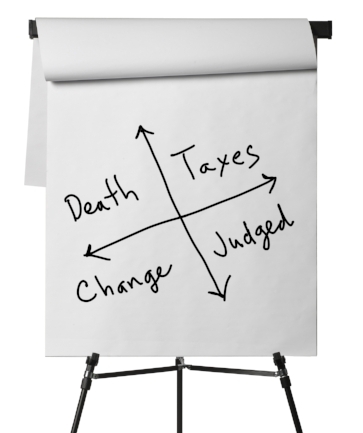 The term “death and taxes” in the flip chart image is often quoted as the two certainties in life voiced by Benjamin Franklin. The graphic pairs Franklin's common sense terms with the words “change” and “judged” because change and judged are better descriptions of the two certainties as faced by businesses. For deliberate long-term success, an enterprise must have an understanding and acceptance of the two certainties— (1) we either purposely change to improve, or natural forces erode and change us for the worse, and (2) what we are is determined through the judgment of others. I wrote the The Language of Excellence as a teaching aid. I discovered by accident that when all members of an organization understand the implications of important management and leadership concepts, magic happens within that enterprise. It is as if someone pulls back the curtain and turns up the lights. Suspicions disappear, replaced by unity. To learn about the behavior of change, to gain an understanding of the rule of the fewest, to be able to put a name to observed phenomena such as the life cycle and suboptimization tears down the iron curtain between “management” and “employees.” A team arises—a competent team, one that shares a core set of beliefs and a common sense of direction—eager to help write their own playbook. I want to clarify that I claim no origination credit for the concepts in The Language of Excellence. They are a compilation of ideas collected, distilled, reshaped, blogged, and even tweeted during fifty years of on-the-job training and a lifetime of reading and listening to the great minds of business—people like Peter Drucker, W. Edwards Deming, Nancy Austin and Tom Peters. The use of graphics and trigger words that bring those visual images to mind was inspired by usability improvements contributed by icons in graphical user interfaces (GUIs), by the power of Tom Peters’s model of excellence, and by the effectiveness of Model-Netics, the graphic image-laden management training courses of American General during my brief tenure with the company. The concepts inside The Language of Excellence, like the Two Certainties apply to life as well as business. The book is one of the best gifts one could give to a young professional. It can be invaluable to the entrepreneur starting a new business or to a seasoned executive frustrated by the difficulty of steering an unresponsive corporate ship. The Language of Excellence teaches the skills for long-term purposeful success. The concept of the Two Certainties conveys that for that long-term success, you must learn to deal with and manage change, and you must accept that you and your accomplishments are what others perceive them to be. For more about The Language of Excellence at a discounted price for bulk purchases go to http://www.tomcollinsauthor.com/language-of-excellence/. For signed copies of books by Tom Collins, go to TomCollinsAuthor.com. Unsigned print and eBook editions are available from Amazon, Barnes & Noble, and other online bookstores. Audio versions of The Claret Murders and Diversion are available from iTunes, Audibles and Amazon. eBook editions are also available through Apple iTunes’ iBook’s Store and Smashwords.com. Commenting on my recent post about my book The Language of Excellence, Marshall Martin said that even years later his business vocabulary still includes "ceremonialism, majoring in minors, indispensable man and I-65 North" among other phrases. Those who haven't read The Language of Excellence are probably wondering what I-65 North has got to do with it. 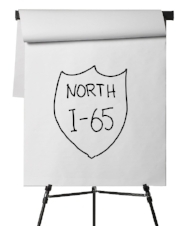 I use “I-65 North” as a metaphor about business. It is also the name of my publishing company. Business is a journey; one that involves constant change and where success is determined through the eyes of those who judge us. The role of a leader is to get people moving in the same direction toward a common destination with a clear understanding of the rules of the road for getting there. I-65 North conveys the idea of a journey with everyone traveling in the same direction—north. North is analogous to the idea of upward progress (the pursuit of excellence). While the destination of the business journey is set and communicated by an organization’s leader, individuals are not robots. If you are on the team, it is because the organization believes in you as an achiever, but many things shape how each member of the team performs in pursuit of the destination. There is not one performance style that has a monopoly on success. The analogy of the interstate conveys this flexibility. Individuals determine their own rate of speed on the journey north, provided they do not go so slow as to impede others or so fast as to recklessly endanger others. As an individual within the organization, however, you cannot go south, east, or west. You as an individual are in control. It is your vehicle, but the leader sets the direction and destination. Business is a journey. The role of the leader is to get everyone traveling in the same direction. Lonely Planet is reading "The Language of Excellence"
The Nashville headquarters of the company Lonely Planet is using my book The Language of Excellence in its management training program. A bulk purchase program is available for companies and organizations that want the book for training or promotional purposes. The book is a powerful training tool—one that makes doing and saying the right things, making the right decisions and avoiding the wrong ones, a habit. The book is also the perfect gift for a company’s business clients or prospects. Sales organizations use signed copies of the book as a door opener—a gift that has the capacity to increase the recipient’s business and personal success. Author and management training expert Gary Slaughter said The Language of Excellence by Tom Collins is among the best five books I have ever read on the subject of management and leadership. For a list of the best five management and leadership books click on FIVE BOOKS. 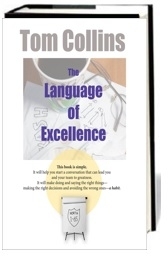 For more about The Language of Excellence at a discounted price for bulk purchases go to http://www.tomcollinsauthor.com/language-of-excellence/. For signed copies of books by Tom Collins, go to TomCollinsAuthor.com. Unsigned print and eBook editions are available from Amazon, Barnes & Noble, and other online bookstores. Audio versions of The Claret Murders and Diversion are available from iTunes, Audibles and Amazon. eBook editions are also available through Apple iTunes’ iBook’s Store and Smashwords.com. Since publishing The Language of Excellence, I have been asked about training services. Yes, I am available for training sessions as well as mentoring and coaching services. In addition to mentoring services Tom Collins is available for selected readings and lectures. To inquire about a possible appearance, contact PLA Media at 615-327-0100 (info@plamedia.com) or to contact the author directly email tom.collins@i65n.com. Tom Collins’ books include his book on leadership, The Language of Excellence, and his mystery novels including Mark Rollins’ New Career, Mark Rollins and the Rainmaker, Mark Rollins and the Puppeteer and the newest mystery, The Claret Murders. For signed copies, go to the author’s online store. unsigned print and ebook editions are available from Amazon, Barnes & Noble, and other online bookstores. For an audio edition of The Claret Murders go to http://amzn.com/B00IV5ZJEI. The ebook edition for the iPad is available through Apple iTunes’ iBookstore.